Description: Price’s force was in full retreat following its expedition into Missouri. On October 28, 1864, it stopped to rest about two miles south of Newtonia, Missouri. Soon afterward, Maj. Gen. James G. Blunt’s Union troops surprised the Confederates and began to drive them. Brig. Gen. Joe Shelby’s division, including his Iron Brigade, rode to the front, dismounted, and engaged the Yankees while the other Rebel troops retreated towards Indian Territory. Brig. 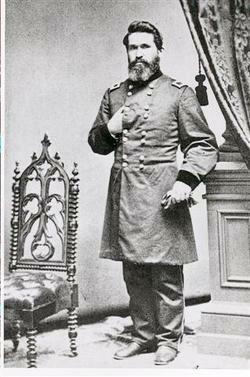 Gen. John B. Sanborn later appeared with Union reinforcements which convinced Shelby to retire. The Union troops forced the Confederates to retreat but failed to destroy or capture them. 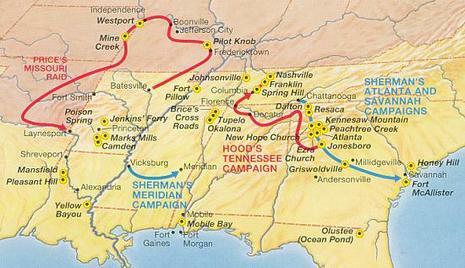 Price's Confederate cavalry force was in full retreat following its expedition into Missouri. On October 28, 1864, it stopped to rest about two miles (3 km) south of Newtonia, Missouri. 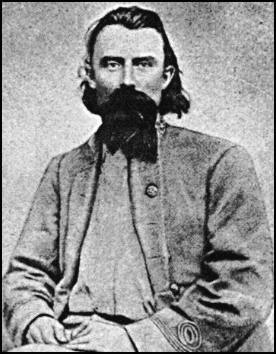 About 3:00 p.m., Maj. Gen. James G. Blunt's Union cavalrymen spotted the rear of Price’s supply train entering the woods south of town on the Cassville road. McLain's 1st Colorado Battery, supported by the 15th Kansas Cavalry, opened on the rebels. Blunt formed the 16th Kansas and 2nd Colorado Cavalry in two lines and personally led a charge behind a screen of skirmishers toward the fleeing supply train. Most of the rebel skirmishers were in no condition (physically or mentally) to resist, and they were soon tumbling backwards. Brig. Gen. Joseph O. (Jo) Shelby's mounted infantry division, including his "Iron Brigade", rode to the front, dismounted, and engaged the Union force. Shelby's men overlapped the flanks of the smaller Union force and forced it back into a large cornfield near the Matthew H. Ritchey estate. There, fighting raged until Federal cannon fire and reinforcements under Brig. Gen. John B. Sanborn finally caused the Confederates to retreat at nightfall. However, Shelby had accomplished his mission in holding up the Union pursuers. By morning, Price had retreated across the desolate prairie towards the Indian Territory. Despite the duration and ferocity of the firefight, casualties were rather light (400 for the Federals versus 250 for the Confederates). Today, most of the battlefield is in private hands. Twenty acres (81,000 m²), plus the Ritchey mansion, are owned by the Newtonia Battlefield Preservation Society.